The team entered the weekend with its sights set on a fourteenth straight class podium finish, having won nine outright class wins and three second places over the past twelve outings for champion Chris Dyer. Coming into this weekends race at Castle Combe Dyer was not only in a comfortable class two championship lead but also was on joint points with class one leader Mark Sumpter for the overall championship title, and with only two meetings left it was important that Dyer finished strong this weekend. 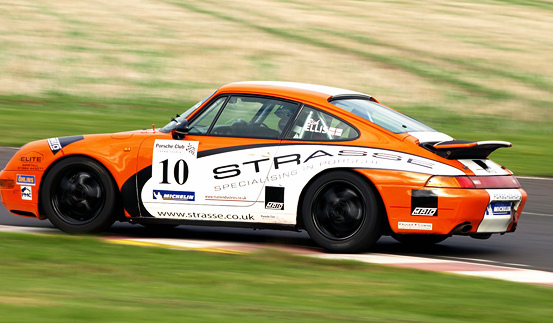 It was an early start for the team with all three Strasse pilots qualifying well for the start of race one. Castle Combe’s second corner "Quarry Corner" is well known for been the most accident prone corner of all the UK's circuits and the drama did not disappoint the large bank holiday crowds. unfortunately it was a Strasse car that was involved. 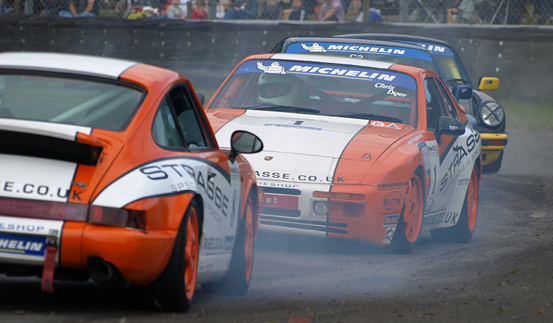 David Botterills Porsche 964 Carrera 2 was hit from behind by Mark Koeberle sending him into spin narrowly missing team mate Dyer on the first lap, in fact it was Botterills clever handling of the car that saved a multi car pile up quickly controlling the car and soon rejoining the race after the field had gone past with a Hugh applause from the crowd. 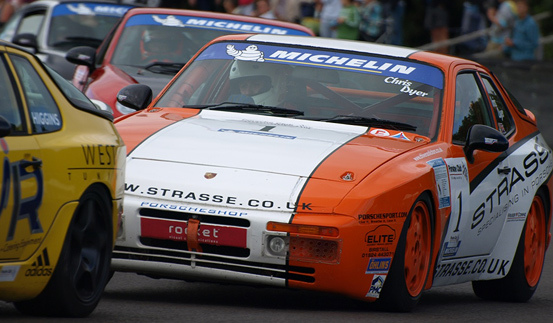 Dyer was also involved in a little tussle exchanging paint work after Karim Moudie hit the side of Dyer at the first corner leaving damage to the side of the 944. 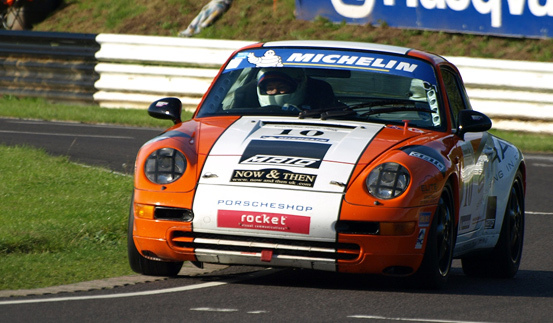 Dyer soon pulled away but was unable to pass Richard Higgins until the very last lap when Dyer edged in front of him on the finish straight after Higgins went wide at Camp Corner taking first place in class two and 7th overall. After the early spin David Botterill put in a blistering performance to catch the mid field pack but time was against him and Botterill was unable catch the front pack prior to the chequered flag crossing the line in 9th place. 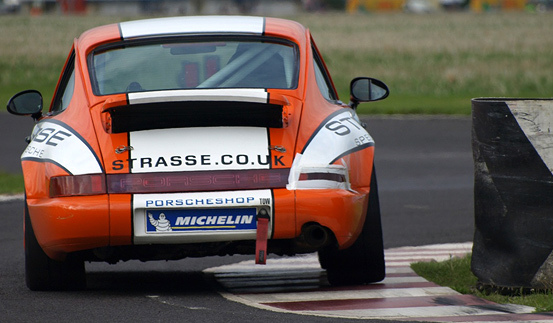 Richard Ellis in the Porsche 993 CS who qualified in 8th place put in a strong performance battling with Paul Follett for most of the race. After a podium finish at the last meeting Richard was showing his potential again to become one of the best, meticulously moving up through the pack crossing the line with the leading pack in 5th place. Richard Ellis..."Qualifying went well considering we only come here once a year making it difficult to get any practice on such a bumpy circuit, it takes a bit of getting used to. I had a great start and managed to avoid a few coming together's and made a bit of a gap running with the first four then about half way through the race I had a good battle with Paul Follett, the car felt great and hopefully improve for race two with a few more chances I felt that I could have got another place". Chris Dyer..."I got a good start but ramped in the side on the first corner by Karim Moudie,and Dave Botterill spun at Quarry in front of me but i just managed to miss him and I just sat behind Richard Higgins for the whole race until the very last lap when Mark Koeberle made Higgins brake late at camp corner and he lost a load of momentum and I pipped him at the line". David Botterill..."I got a good start and I managed to find a way through the traffic after Richard Bennett stalled at the start and got passed Chris dyer and a few others and managed to get up to fifth but coming into quarry I got a little kiss from behind, in fact it was quite a whack and it spun me round, I managed to control the spin and managed to revise down the straight so the other cars coming towards me could avoid me, I got the car restarted and started to chase down the field, I had a good battle with Richard Bennett I got the better of him and soon took Karim Moudie and pulled away but the race was too far in to catch the rest, but the car felt realy good". Chris dyer got off to a blistering start making up three places from 8th on the grid to 5th place overall mixing it up with the class one cars and for the first four laps it looked like he was pulling away from the field leaving a three second gap between him and the three class one cars behind him. It was not long before Team mate Richard Ellis regained his grid place overtaking Dyer soon followed by class one pilot Richard Higgins who came through the field like a rocket. Dyer managed to to keep up with the leading class one cars for a healthy first stint of the race before the more powerful class one cars pulled away. Dyer finished the race almost a lap in front of the remainder class two field taking a convincing second class win of the day and 7th overall. Richard Ellis..."I had a good start but managed to find myself on the wrong side of the track going into quarry and lost the inside line and lost time but I had a good battle trying to get back up with the front runners, the car felt good and the race was a lot of fun but my tyres started to go off but I still felt happy with the pace we where running at and managed to hang on to 5th place. with Petter Morris closing in on me I had defend the line hard and was just glad that there where no more laps left to race". Chris Dyer..."I got a cracking start and managed to get up to fifth with Richard Ellis behind me, we had a god tussle together for about three or four laps then he got passed me, I managed pull well ahead of any on else in class two and i could see Peter Morris behind me passing David Botterill, Karim Moudie and Richard Higgins and he just started reeling me in and come past me like a rocket but I enjoyed the race and are pleased with the two firsts and the two fastest laps. We will have to see what Silverstone brings in the final rounds". David Botterill..."The start was very simler to race one, I set off from the line and a car stalled in front of me so I had to take evasive action and got a good run up to quarry but Karim Moudie got down the inside of me and got in front of me I then spent the next half of the race looking at his rear bumper trying to find a way round, I eventually found a way round him and pulled away but then the exhaust started to blow and I lost power and had to settle for 8th place". With Mark Sumpter wining both his class one races Dyer and Sumpter are both still locked togther on points for the overall championship title heading into the last rounds at Silverstone Northants. September 30th / October 1st 2011.